A former early childhood educator, Debra Britt began performing her characters in 2004. In addition to her characters, Mrs. Britt is an avid doll collector with more than 5,000 dolls of color in her repertoire. 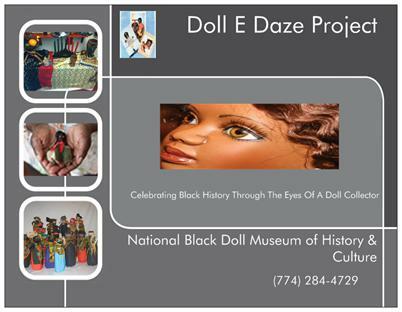 This self taught doll artist has been a featured storyteller for Boston Public Library Big Read Program, the Isabella Gardner Stewart Museum, The United Federation Doll Convention, United States Army Fort Devens Medical division, The METCO Educators Convention, Philadelphia Doll Museum, Boston, Brockton Arts Festival and several Massachusetts school systems. Debra has been a consultant for the Massachusetts State Troopers, Dept. Mental Health (PAL Program) Boston Children’s, Women at Work Museum and the Museum at the Mill in Attleboro, MA. Debra is a member of New England Museum Association and the Mansfield Cultural Council. Her program has been nominated for the Massachusetts Gold Star Award which recognizes exemplary cultural programs funded by local cultural councils.